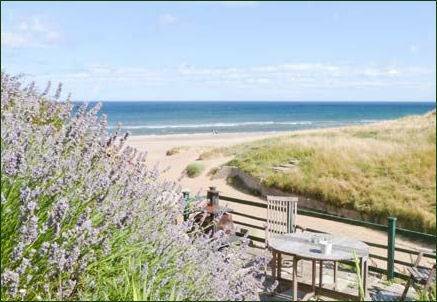 The village of Marske-by-the-Sea is located between the seaside resorts of Redcar and Saltburn-by-the-Sea. The village is mentioned in the Domesday Book of 1086. St Germain's Church was consecrated by bishop Ægelric between 1042 and 1056. All that remains of the church of St. Germain near the seafront is the tower which was rebuilt in 1821. Captain Cooks father is buried in the churchyard, he died in 1779 six weeks after Cook himself, although never knew of his sons death.The Norman font from St Germaine's church is now housed at St Mark's Church in Marske which was built in 1865-1867 in an early English style. Marske boasts two imposing houses, Marske Hall, now a Cheshire Home, was built around 1625 and was formerly the home of the Zetland family. Cliff House, which stands on the cliff tops overlooking the sandy beach, was built in the nineteenth century as a holiday residence for the Pease family, who were prominent in the north-east business community, at the time, and principal shareholders in the Stockton and Darlington Railway. The railway was extended to Redcar in the 1h 840s and to Marske and Saltburn in the 1860s. The village has its own post office, medical centres, leisure centre and a library, it also has Methodist, Roman Catholic, Baptist and Church of England churches and five public houses: The Frigate, The Ship Inn, The Zetland, The Mermaid and The Clarendon. 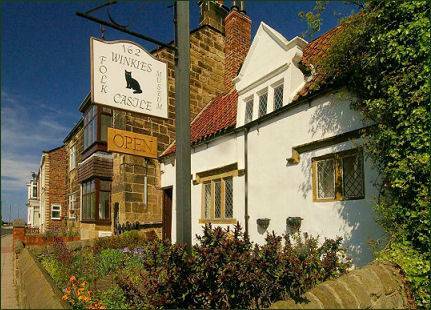 Marske-by-the-Sea is also home to a museum, known as Winkies Castle (pictured right), it is run by Volunteers and open to the public from Easter Saturday each year until the end of September. The museum is an old half cruck cottage formerly owned by the master shoemaker, Jack Anderson. The house's name is said to derive from Jack's cat named Winkie. The entrance hall features a new timeline which depicts events in Marske's history from the eleventh century to the present day and features many references including the burial of Captain James Cook's father in 1779; a visit to the town by author, Charles Dickens in 1844; the First World War aerodrome which counted W.E. Johns, the author of the famous 'Biggles' books as one of its instructors and Malcolm Campbell's land speed record on Marske Beach in 1922. Re-dressed period rooms and a fascinating audio-visual presentation inform visitors of Marske's history. The building was saved from demolition in 1968 by Jack Anderson when he turned it into a community museum and bequeathed it to the Community of Marske. It is the oldest house in Marske-by-the-Sea, dating back to the seventeenth century.